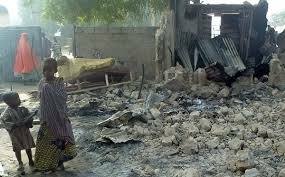 Boko Haram Insurgents set three Borno villages on fire, loot foodstuffs – Royal Times of Nigeria. 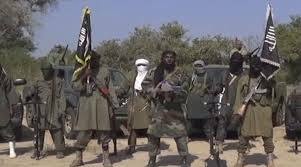 Boko Haram insurgents on Wednesday night burnt down three villages in Konduga Local Government Area of Borno State, in an attack that left at least seven people dead. It was gathered that the insurgents attacked and set Wanori, Kaleri and Amarwa villages on fire in a two-hour operation that began at 9pm. Villagers said the insurgents shot indiscriminately, looted food items before setting the villages on fire. Competent security sources told NAN that the insurgents were sighted on motorcycles along the Alau General Area. “We suddenly started seeing fire from Dalori, Kaleri and Amarwa followed by continuous gunshots from the area. “The Alfa jet was quickly deployed in the scene but the insurgents had taken over the villages as of that time,” one of the security sources said. A resident of Amarwa, Goni Kachalla, who fled the attack amidst the onslaught by the insurgents, said they were shooting everybody and people fled in different directions. “I am yet to locate my family members,” Kachalla said, adding that the insurgents looted their belongings shouting Allahu Akbar and shooting everybody. Usma Grema, another victim of the attack said all houses in Kaleri were set ablaze by the attackers, adding that “the jet came and chased them away. I have lost everything.” Bello Dabbatta, Head, Emergency Response of the State Emergency Management Agency, confirmed the attack and said the agency had deployed its personnel in the affected areas. Dabbatta said that he was yet to get the number of people killed or injured. aBoth the National Emergency Management Agency and the Borno State Police Command also confirmed the attack but said they would respond as soon as they had details on the incident.